My current razor was the Schick Quattro for Women, and a refill of 4 blades can cost well over $10, depending on where I get them. Sometimes I’m lucky, and they’ll be on sale for $8 or so. That’s anywhere from $2-$2.50 per blade. 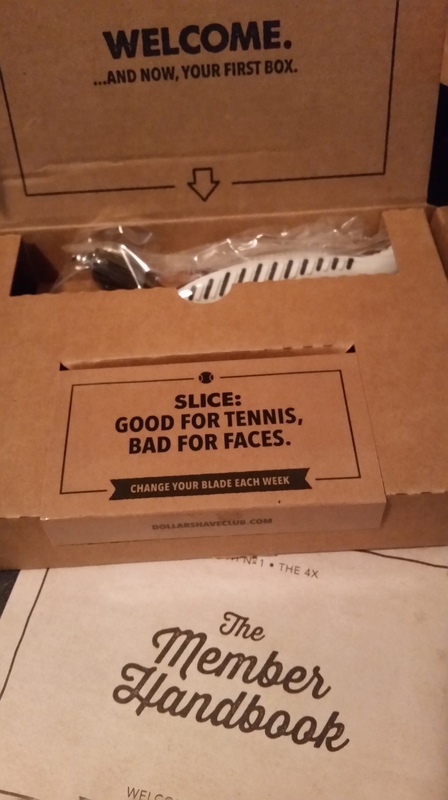 So the idea of a service that would not only provide me with cheaper blades but would also deliver them directly to my door intrigued the hell out of me. I’d be saving money and getting more convenience. Dollar Shave Club offers three different types of razors. All cartridges include a lubricating strip on top and a pivot head, and you get the handle for free with your first box. (You can change razors at any time, and when you do, they’ll send you another handle. If you need additional handles, you can buy them.) The cheapest option is “The Humble Twin,” a twin blade, and you get 5 cartridges per box for $1 + $2 shipping. This is the ONLY plan that makes you pay shipping, but $3 total for 5 cartridges is a great deal compared to what you’ll find in a drug store. That’s 60¢ per cartridge, and you don’t have to leave your house! The second plan is “The 4x,” a four-blade cartridge as the name would suggest. For $6 and free shipping, you get four cartridges per month. That’s $1.50 per cartridge, free shipping, and not having to put on pants. The third plan starts to get back into the drug store prices you’ll pay for your blades. It’s called “The Executive,” and while you probably aren’t going to save any money here, it’ll cost about the same as what you’re likely already paying, and you still don’t have to put on pants. For $9 and free shipping ($2.25/cartridge), you’ll get four cartridges with six blades each. It also features a trimmer edge. Your boxes are either delivered monthly or every other month, depending on your preferences. You can even put your shipping on hold for a while if you need to for whatever reason. I have selected the every other month option, as I only need to shave 3-4 days/week and so change my blades once every two weeks. I always appreciate humor in packaging. I chose the 4x plan. It got here much faster than I expected. I ordered it on the 25th, and it got here on the 29th. The packaging isn’t anything fancy, though I wonder if the following boxes will be smaller. I see no need for something this big if I’m just getting the cartridges. Time will tell. 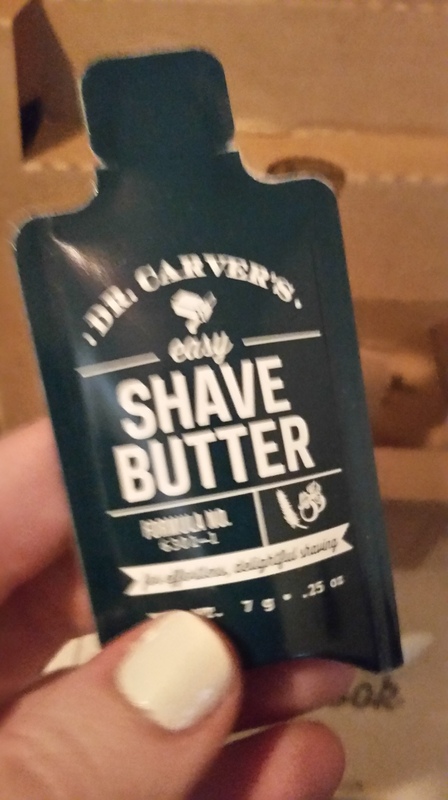 My sample of Dr. Carver’s Easy Shave Butter. Sorry for the blurs. The dog decided to give my arm a sniff right about here. 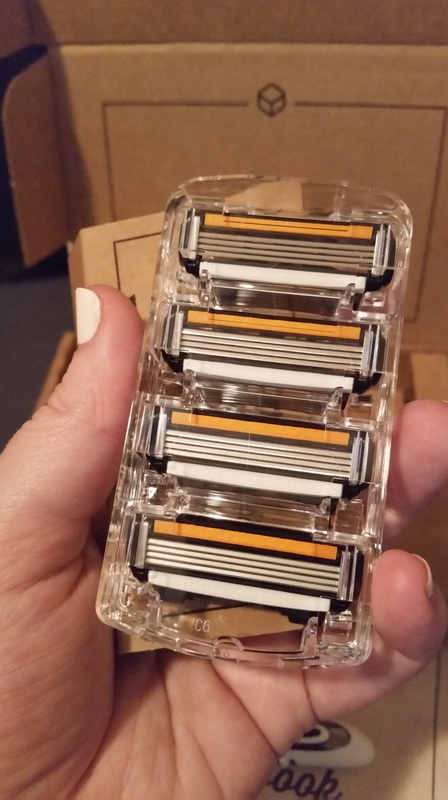 The blades are packaged pretty much like any other razors I’ve seen. My husband immediately noted that they look kind of like his Quattro cartridges, and I agree. So I snapped one of these babies onto the handle and gave it a try. I started with the shave butter, since I’ve seen some rave reviews on this stuff. It goes on clear, and you’re supposed to leave it on for a few seconds before shaving. Oh, baby! “Butter” is a good word for this stuff! I have a small stockpile of Skintimates gel to get through first, but I did end up adding a tube of this to my next box, which should ship to me in October. It created a lovely and slick surface that the razor just glided over, and my legs felt so freaking soft after. I’m completely sold. The pivot head on the razor is spoiling me. I’ve had pivot heads on my razors before, but this one pivots more, and it handled my knees and ankles with perfection. I didn’t get a single nick. Not one. But my legs were smooth and soft. I feel like walking up to strangers and asking them to touch my legs, but I won’t because that would be weird. My husband is enjoying it, though. I love this company. I really, really, really, really, REALLY love this company. I still want to try out Harry’s just to see which I like better, but Dollar Shave Club really has made an amazing first impression. This handle and blade cartridge are definitely an upgrade from what I was using, the shave butter is well worth the $8 price tag, and it’s actually saving me money! Wanna try Dollar Shave Club? Click here.